Human trafficking is an issue that affects many in our community, yet it is one we don’t talk about much. Awareness is a vital tool in the protection of our most vulnerable populations. When interested parties know what to look out for, these crimes are more often accurately reported to authorities with the ability to step in. So what is human trafficking, and what can you do about it? 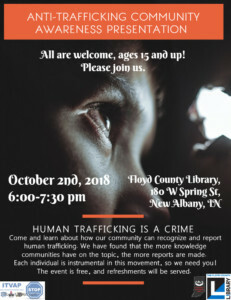 October 2, at 6:00 PM, the Indiana Trafficking Victims Assistance Program will present an informational session in The New Albany-Floyd County Library’s Strassweg Auditorium. This program will be free and open to the public, although due to the upsetting nature of some of the information that will be presented, ITVAP has asked that children under 15 not attend. Topics covered will include the definition of human trafficking, risk factors and red flags, and appropriate community response. Learn what to look out for, who is most at risk, and who you should report to if you see something suspicious. There will be light refreshments. No registration is required. Melinda is a librarian at the Floyd County Library.